Have you had any issues keeping your Colorado Springs home warm this winter? Has any of your family members noticed cold drafts and cold spots throughout your home? While these can be common issues that any home in Colorado faces, finding the right energy efficient solution can make all the difference. Siding and window replacement can be the ultimate energy efficiency goals but do require a lot of time and money that most homeowners don’t have in their current budget. The quickest, easiest solution that is highly effective is 3M Thinsulate window film. 3M Thinsulate window film delivers the insulation benefits that any Colorado Springs home can take advantage of. By adding a thick, insulating layer to your windows and glass doors, homeowners can experience a 10% to 15% reduction in winter energy costs. These energy efficient benefits are also available during the summer– homeowner can save up to 30% during the summer months with 3M Thinsulate window film. In addition to the great energy savings and improved home comfort, glare reduction and UV protection are also included advantages. By blocking UV rays, your family and expensive furnishings will remain safe from sun damage. Glare reduction really improves family movie nights as well as productivity when working from home. Colorado Springs Window Film: 3M™ Thinsulate™ Window Film from Colorado Springs Window Film on Vimeo. 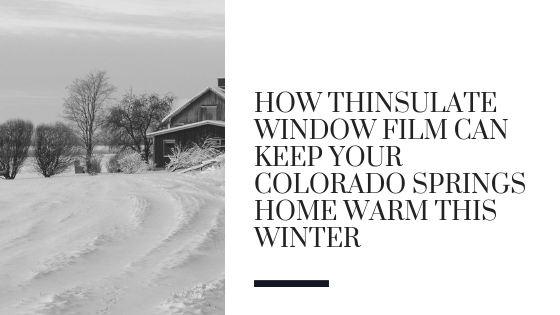 Colorado Springs Window Film is happy to provide complimentary in-home consultations in order to ensure that 3M Thinsulate window film is right for you. One of our energy efficiency experts will meet with you to discover property challenges and requirements. We offer quick, stress-free installations for all of our residential clients so that your home can experience immediate results. For more information regarding 3M Thinsulate window film benefits for your Colorado Springs home, please contact us!